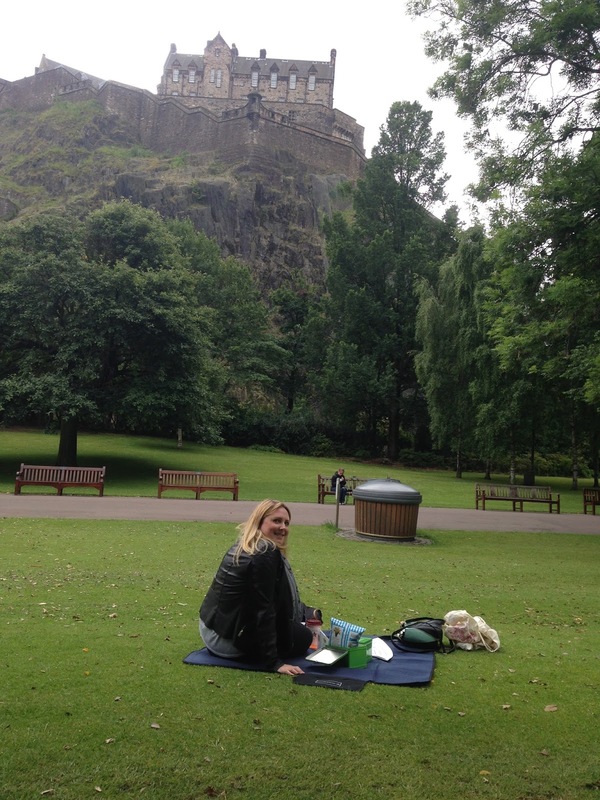 Summer in Scotland can be unpredictable, so I was being quite optimistic when I planned a picnic lunch with Lianne last week. True to form, I woke up that morning to the sound of rain pelting off my window. Great! I was determined that we'd still go ahead with our plans though, even if it meant sheltering under umbrellas. 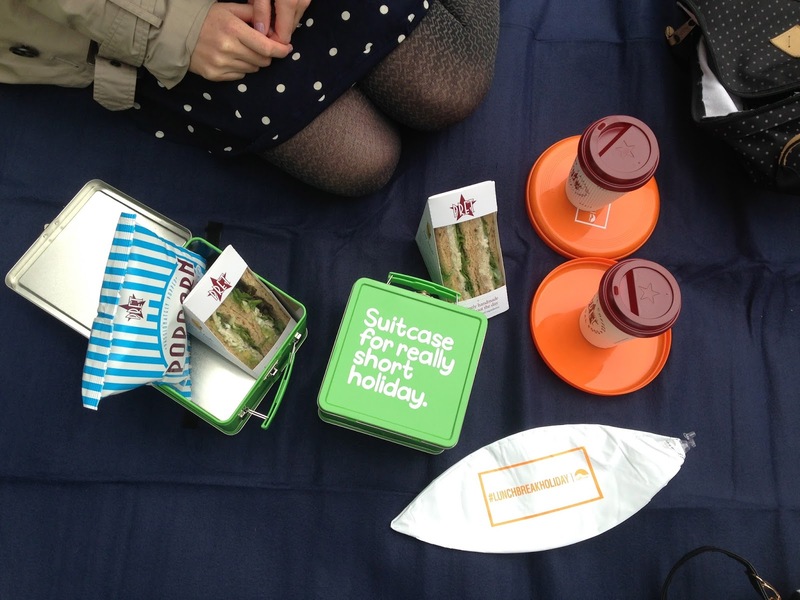 Luckily for us though the weather cleared up by lunch time so off we went to Princes Street Gardens, blanket and lunch boxes in hand. The reason for our meet up was that I'd been contacted by Travel Supermarket and asked to take part in their #LunchBreakHoliday campaign where they are encouraging people to make the most of their lunch hour. They are also running a competition by the way, so if you tweet or Instagram pictures of your #LunchBreakHoliday (tagging @TravelSupermkt on Twitter) then you could be in with the chance of winning a summer party for you and your colleagues worth £4,000. Now, despite working on Princes Street and having the beautiful gardens (and that castle view) on my doorstep I've actually NEVER taken advantage of my surroundings and had lunch in the park (I'm convinced that the minute I take food outside I'll be savaged by wasps). I'm normally outside for all of 10 minutes at lunch, and that's just to buy food. 4/5 days I go to either Sainsburys or Tescos to buy a salad and some chicken - exciting - but I normally "treat myself" to a Pret lunch once a week*. *I am obsessed with their tuna & rocket sandwiches. Seriously, I don't know what sort of drugs they put in them** but I can't get enough. **Only joking Pret, I know you don't spike our sandwiches. Please don't sue me***. ***Whilst we're chatting - if you'd ever like me to review your sandwich range you can contact me on hello@cocktailsanddaydreams.com. #bloggerrequest. #pleasegivemefreesandwiches. Once I've bought lunch I generally go straight back to my desk where I stick on my headphones, load up my Youtube Watch Later list and catch up on my subscriptions. After I've eaten I'll then normally do a bit of online shopping, or some sort of wedding planning (at the moment I'm looking for shoes. I'm starting to lose the will to live). Anyway, point being - I basically squander away my lunch breaks indoors like some sort of agoraphobe - so this #LunchBreakHoliday campaign was the perfect excuse to get me out of those bad habits and venture out into the fresh air. As part of our lunch break picnic set we were given some frisbees and beach balls - the idea being that you'd embrace the #lunchbreakholiday spirit and have a couple of games with your colleages/friends. Now I'm sure some of the other bloggers who took part had a great time tossing their frisbees around in the sunshine, but for me a summer holiday is all about chilling the F out. You won't catch me playing beach games in a million years. If you need me I'll be by the pool reading a book, ideally with a cocktail in hand, or an ice cream, or both if I'm lucky. So we took a slightly different tact with our hamper…..using the beach balls as pillows and the frisbees as coasters for our drinks. Ahhhh summer. Despite our lo-key lunch break holiday I had a really lovely time with Lianne, it was nice to just have a catch up and do a spot of people watching (we even saw the worlds biggest dog!). Also as managed to get through lunch without being attached by wasps and/or seagulls, I think I might be warming to this whole eating outside thing. I'm definitely going to take myself out for a solo picnic the next time we have a nice day - now that I've got a picnic blanket (cheers!) I can just see me sitting out with a sandwich and a book, like a strong independent woman who lunches on her own and isn't scared of no wasps. Oh and also, as I was leaving the gardens I noticed that the little cafe near the entrance sells slush puppies, which is incentive enough for me to go back ASAP. So yes, a strong independent woman who lunches alone, isn't scared of no wasps, and drinks slush puppies whilst giving no fucks. I think in the UK, we're a hardy bunch ... we know our summers can change in a second. So you did right, and just went ahead and enjoyed.